Tim Minchin · Jesus Christ Superstar DVD available for pre-order now! Jesus Christ Superstar DVD available for pre-order now! Tonight, Tim hits the stage at the O2, for the first time as Judas in Tim Rice and Andrew Lloyd Webber’s spectacular UK arena tour of Jesus Christ Superstar. To coincide with opening night, we’re pleased to announce that there will be a DVD and Blu-ray release of the show coming out on the 19th November 2012. 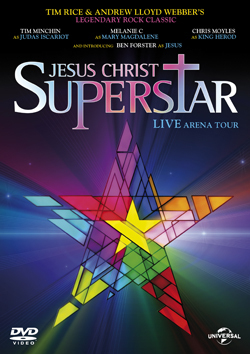 Jesus Christ Superstar Live Arena Tour 2012 is available to pre-order now from the Jesus Christ Superstar website, Amazon and Play.com. Along with Tim in the role of Judas Iscariot, the fabulous line up includes Melanie C as Mary Magdalene, Chris Moyles as King Herod and Winner of the ITV primetime show Superstar Ben Forster in the title role of Jesus. For more information about the show visit the Jesus Christ Superstar website or our previous blog here. The show will be filmed live as part of the 2012 arena tour, so you’ll be able to relive it if you’re lucky enough to have tickets or to experience it fresh if you’re not able to make it along to any of the dates. Are they ever going to release a SOUNDTRACK from the DVD? We want to be able to listen to it everywhere! I live on the wrong side of the planet… and suffer for it. Wow Tim, just watched the DVD, you were truly amazing. It’s so wonderful to see you fulfilling your destiny as a performer and getting the opportunities and recognition your skills and talent deserves. Can’t wait to see you in Aus in this role! Enjoy the ride! Best show ever!!! Tim you are a genius! Loved you before, love you even more now! Was blown away with your performance. Went to Birmingham and Nottingham! Even got to meet Sir Andrew Lloyd Webber! Amazing! Tim what an amazing performance in Jesus Christ Superstar. I have seen JCS before but this a very different updated version, loved it. Got the message across. The voices from all performers amazing. I encourage anyone to go and see this. Amazing performance of JC Superstar in Nottingham last night! Tim you stole the show – brilliant!!! Tim, you were awesome as Judas. Your performance blew me away and put the others actors into the shade with your vibrancy, quality and uniqueness. fantastic, fantastic performance as Judas, really impressed. saw show in Manchester tonight. I was taken to see jesus Christ Superstar at the NIA Birmingham on 5th October. Tim Minchin stole the show. He was absolutely amazing. As an older lady I had never come across any of his performances before, but was very impressed with just how talented a singer and actor he is. If you can get to see the show, do go, you will not be disappointed. Thank you Tim it was the best birthday present I have had in a long time. Both Tim and Ben were unforgetable….. Saw Jesus Christ Superstar in Birmingham last night. What a performance. Tim Minchin was an amazing Judas, I was so emotional by the end. Fantastic night!!! We saw Jesus Christ Superstar in Cardiff last night and Tim Minchin was absolutely mind-blowingly amazing. Best Judas ever. Thank you we had a fabulous night. I saw you yesterday night in Cardiff as Judas Iscariot and I enjoyed every single second of your performance. I went to see this last night for my 18th birthday, it was absolutely incredible! Tim you were the star of the show. I adore you and was so moved by your performance!! Saw Jesus Christ Superstar yesterday. Thought the show was fab. Your portrayal of Judas was as better that then I expected. Will there be a CD released with the 2012 arena cast. Do you know if or when there will be a region 4 DVD? As was the rest of the cast, the set, the music, the atmosphere – amazing! The show really was a spectacle to behold. Great news!!! I’m supposing in the US too? We need Region 1! You help in this matter won’t go unrewarded, we’ll pay you in silver, cash on the nail! My thoughts exactly. Any chance of a region 1 DVD from amazon.com? Any idea if these DVDs are region-specific?